The .38 Super, also known as .38 Superauto or .38 Super Auto, is a pistol cartridge that fires a 0.356-inch-diameter (9.04 mm) bullet. The Super was introduced in the late 1920s as a higher pressure loading of the .38 ACP or .38 Auto. The old .38 ACP propelled a 130-grain (8.4 g) bullet at 1,050 ft/s (320.0 m/s). The improved .38 Super Auto pushed the same 130-grain (8.4 g) bullet at 1,280 ft/s (390.1 m/s). The .38 Super has gained distinction as the caliber of choice for many top pistol match competitors; it remains one of the dominant calibers in IPSC competition. The cartridge was designed for use in the M1911 pistol and was capable of penetrating the body armor and automobile bodies of the late 1920s. When the .357 Magnum was introduced in 1934, this advantage of the .38 Super was no longer enough to lure police departments and officers from the traditional revolver. The .38 Super retains the original dimensions of the .38 ACP case. The cartridge was originally designed to headspace on the semi-rim, which worked in the Colt M1900 due to the design of the feed ramp. When the .38 Auto became the .38 Super, in the 1911A1, the feed ramp could no longer be used as rim support. As a result of this, observed accuracy of the .38 Super suffered until Irv Stone of Bar-Sto barrels re-designed the chamber to allow headspacing on the case mouth. Since then, all new production .38 Super pistols headspace on the case mouth, as with other cartridges in this class. The semi-rimmed case is known to cause feeding problems in some magazines, especially double stack magazines, and led to the development of new variants with reduced rims (typically only .003" per side). In 1974 the industry added the +P headstamp to the .38 Super to further distinguish it from the lower-pressure .38 ACP. Most current ammunition manufacturers label ammunition for the Super as .38 Super +P. Since the .38 Super is dimensionally the same as the .38 ACP, an unsafe condition can be caused by firing .38 Super cartridges in a firearm designed for the much lower pressure .38 ACP. The weakness, in the Colt M1900, M1902 and others derived from that design, comes from the assembly wedge at the front of the slide. If the wedge comes out, or the slide cracks at the wedge, the slide can come off the rear of the frame when fired. The 1911 and 1911A1, having a slide that is solid on front, cannot come off the frame that way. 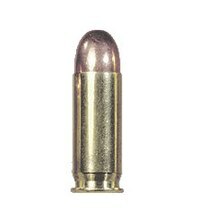 The .38 Super has 1.14 ml (17.6 grains H2O) cartridge case capacity. .38 Super maximum C.I.P. cartridge dimensions. All sizes in millimeters (mm). The common rifling twist rate for this cartridge is 406 mm (1 in 16 in), 6 grooves, ø lands = 8.79 mm, ø grooves = 9.02 mm, land width = 3.07 mm and the primer type is small pistol. Both SAAMI and C.I.P. specify a bullet diameter of 0.356 inches (9.04 mm). According to the official C.I.P. (Commission Internationale Permanente Pour L'Epreuve Des Armes A Feu Portatives) guidelines the .38 Super case can handle up to 230 MPa (33,359 psi) piezo pressure. In C.I.P. regulated countries every pistol cartridge combo has to be proofed at 130% of this maximum C.I.P. pressure to be certified for sale to consumers. The SAAMI pressure limit for the .38 ACP or .38 Auto is set at 182.72 MPa (26,500 psi), piezo pressure. The SAAMI pressure limit for the .38 Super +P is set at 251.66 MPa (36,500 psi), piezo pressure. The C.I.P. and SAAMI specified .38 Super (+P) has a semi-rimmed cartridge case. In recent years, cases such as the .38 Super Comp, .38 Super Lapua, .38 Super RL (Armscor), and .38 TJ (.38 Todd Jarrett) became available transforming the .38 Super into an almost truly rimless cartridge. These "rimless" cases are somewhat of a misnomer, due to the case rim not retaining the same diameter as the case wall just forward of the extractor groove. A common example is the .38 Super Comp case, which has a semi-rim extending only .003-.004" per side, compared to standard .38 Super which has .007-.009" per side. The main reason for the development of new cases was due to the semi-rimmed .38 Super case not always feeding reliably from the double-stack box-magazines used in several semi-automatic pistols popular with practical shooting sports, such as USPSA or IPSC. The nearly rimless cases improve feeding reliability in these pistols but are intended to be used in firearms that headspace on the case mouth. Other improvements found in some of these cases are modified extractor grooves and increased thickness in key parts of the brass for high pressure loadings. Because of its larger case volume, which allows for more smokeless powder and results in higher muzzle velocities at approximately similar pressure levels, the .38 Super offers higher bullet velocity potential than the 9×19mm Parabellum when handloaded and in some defense loadings. The 9×19mm Parabellum is however approved for higher pressure +P loadings by both SAAMI and C.I.P., which compensates for much of the case volume difference in factory-loaded ammunition. The .38 Super is generally regarded as a well-balanced cartridge with a flat trajectory, good accuracy and relatively high muzzle energy; most loadings have greater muzzle energy than many factory-loaded .45 ACP loadings. Cor-Bon/Glaser offers the .38 Super +P in several full-power self-defense–style loads with advertised velocities such as 115 gr 1,425 ft/s (434 m/s) and 125 gr 1,350 ft/s (410 m/s). Tests with ammunition besides Cor-Bon/Glaser increases velocity by between 25 ft/s (7.6 m/s) to 50 ft/s (15 m/s) on average. The .38 Super has made a comeback in IPSC and USPSA sports shooting raceguns, particularly when equipped with a compensator, because it exceeds the power factor threshold to be considered a "major" charge, while having much more manageable recoil than .45 ACP. Part of the felt recoil reduction is due to the use of lighter-weight bullets. The major cause of reduced felt recoil is a compensator, or muzzle brake. The "comp" works by diverting gases at the muzzle. The greater the gas volume, or the higher the pressure, the greater the effectiveness of a comp. As the Super runs at a higher pressure than, say, the .45, a comp will have more recoil-reduction effect. The comeback began in the early 1980s, when Robbie Leatham and Brian Enos began experimenting with, and competing with, .38 Super pistols in IPSC. At the time, single-stack 1911s in .45 ACP were dominant. Their .38 Super pistols held one or two more rounds simply due to the smaller case diameter. However, the biggest advantage was the muzzle brake, allowing for faster follow-up shots, and thus faster stages and subsequent higher scores. Competitors still using .45 ACP pistols attempted to keep pace, both by adding compensators and by reducing bullet weight, quickly reaching the limit at 152-155 grains. The Super could be loaded to major with a bullet as light as 115 grains. Use of compensators in competition is limited to the Open Division in IPSC and USPSA. The other divisions there do not permit their use, and the International Defensive Pistol Association (IDPA) does not permit them at all. Lacking a comp, a .38 Super, running at major, has felt recoil much like that of a .45 ACP, and more than that of a 9 mm. Apart from its popularity in the shooting sports, the .38 Super +P is one of the most popular pistol cartridges in Latin America due to local restrictions on civilian ownership of firearms chambered for the military cartridges, such as the .45 ACP. For this reason, American police departments in the southwestern United States often consider .38 Super shell casings found at homicide scenes as a sign that the firearm was of Latin American origin. The .38 Super round received further publicity through the single-action "Colt Combat Commander" and lightweight aluminum alloy frame "Colt Commander". When Colt switched the inventory's supply of the model from the Series-70s to the Series-80s, the model fell into lesser demand. A small number of submachine guns, such as the Ingram Model 6 and Thompson submachine gun, were chambered in .38 Super. A machine pistol variant of the M1911 chambered in .38 Super was also produced by Hyman S. Lehman. The .38 Super +P cartridge ballistics have been improved over the years by the use of modern propellants. Ammunition is now available with velocities exceeding 1,400 ft/s (430 m/s). This is impressive from a semi-automatic pistol and is comparable to the .357 SIG. The .38 Super +P is very popular in Australia (partly due to firearms laws prohibiting calibers over .38 from use in IPSC), and in and Latin America in regards to competition shooting and is also finding its way back into the role of a CCW caliber. Ammunition can now be found in the hollowpoint style bullet with excellent ballistics. A standard single stack magazine 1911 style semi-automatic pistol holds nine to eleven rounds with one in the chamber. Double stack magazine pistols in this cartridge holds fifteen to eighteen rounds with one in the chamber. ^ Speer Reloading Manual #13, 1998, 1999. ^ Boatman, Robert H.: Living With the 1911: A Fresh Look at the Fighting Gun, page 15. Paladin Press, January 2005. ^ Ayoob, Massad (March 2001). ".38 Super". Guns Magazine. Archived from the original on 2004-09-09. Retrieved 2006-04-01. ^ "C.I.P. decisions, texts and tables - free current C.I.P. CD-ROM version download (ZIP and RAR format)". Archived from the original on 2009-06-06. Retrieved 2008-10-17. ^ a b "Voluntary Industry Performance Standards for Pressure and Velocity of Centerfire Pistol and Revolver Ammunition for the Use of Commercial Manufacturers" (PDF). American National Standard Z229.3. Sporting Arms & Ammunition Manufacturers' Institute, Inc. Archived from the original (PDF) on 16 October 2013. Retrieved 4 May 2013. ^ Rimless .38 Super Brass. ^ Holloway, T. (2015). A Guide to Handgun Cartridges. Lulu.com. p. 102. ISBN 978-1-329-00762-8. ^ "Ingram Model 6 (M6) submachine gun (USA)". World Guns. Retrieved 2011-09-28. ^ Frank C. Barnes (2014). Cartridges of the World: A Complete and Illustrated Reference for Over 1500 Cartridges. Gun Digest Books. ISBN 1440242658. ^ Thompson, Leroy (2011). The Colt 1911 Pistol. Osprey Publishing, Limited. p. 22. ISBN 1-84908-836-5. ^ The .38 Super +P compared to other pistol cartridges. Wikimedia Commons has media related to .38 Super. This page was last edited on 14 January 2019, at 14:31 (UTC).